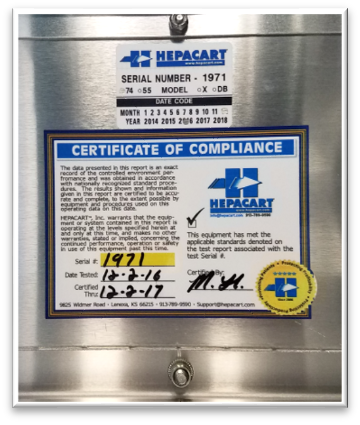 Each product that has a negative air machine with HEPA-Filtration is Certified as a unit with an on-site Controlled Environment Performance Test and Certification Report. 2. IEST-RP-CC002.3, Unidirectional Clean Air Dev. All of this equipment is tested and recertified on an annual basis. 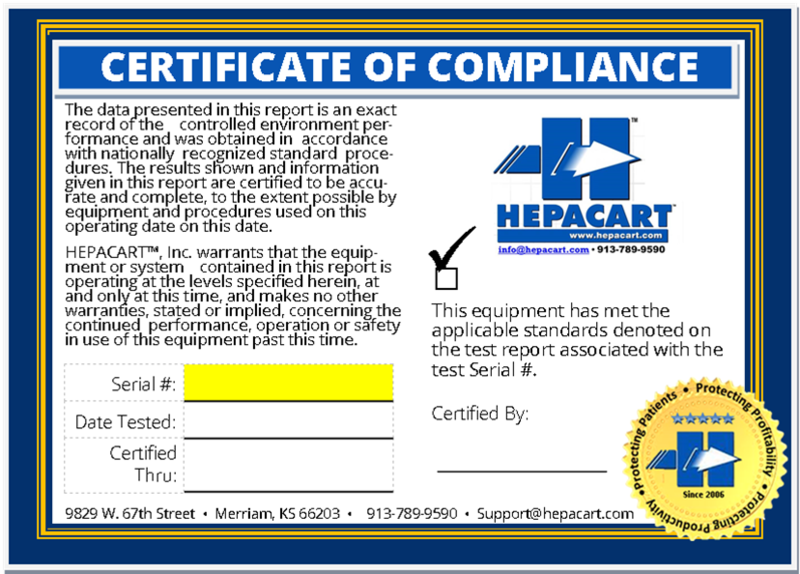 Each HEPACART® design has been lab-tested by LMS Technologies, Bloomington, MN. 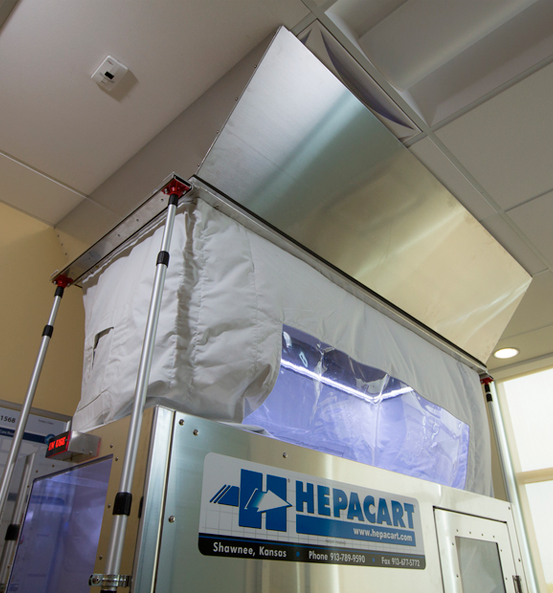 Each HEPACART® design has been smoke tested to make sure the air is being contained and filtered. 1. IEST-RP-CC0034.3: HEPA and ULPA Filter Leak Tests (Institute of Environmental Sciences and Technology)2. ISO 14644-1: Cleanrooms and Associated Controlled Environ-ments—Part 1—Classifications of Air Cleanliness.Air Flow Testing: HEPA-filter air-flow velocities are measured in Cubic Feet per Minute (CFM) with the use of an Air Data Multimeter with the capture cone attachment. Emory 3004 (PAO) is utilized as the aerosol challenge material. Distribution is via cold laskin nozzle generation introduced into the upside of the exhaust HEPA-filter. A particle counter is used to scan the HEPA filter. The HEPA-filter and the frame are scanned at a rate not exceeding two inches per second at a distance of approximately one inch from the exit plane of the HEPA-filter. The HEPA filtered exhaust air needs to meet an ISO 14644 Class 5 environment in an at rest condition. 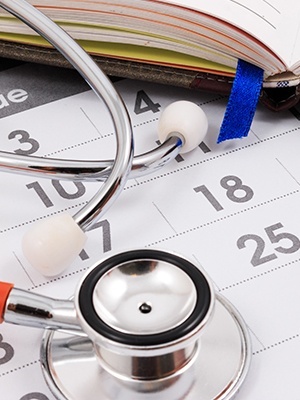 Annual recertification of the equipment is due one year from the testing date.